Compression Cable Lugs – be safe, use a system! When you buy your cable lugs from your local wholesaler, how do you know if the crimping tool you have is compatible? A poorly crimped cable lug will cause an increase in joint resistance, creating heat and in the worst case, a fire. A hexagonal crimp form is the preferred style for most installers. It looks neat and creates a good connection. But a hexagonal crimp is very size specific to the diameter of the cable lug to create a perfect result (OD & ID). If the Cu tube size is smaller than that of designed die, the crimp will not compress enough. If the Cu tube is too large, the crimp will create flash or ‘ears’ on the side of the connector. Quite often, the installer will file these off which reduces the amount of Cu in the lug and creates a high resistance connection. 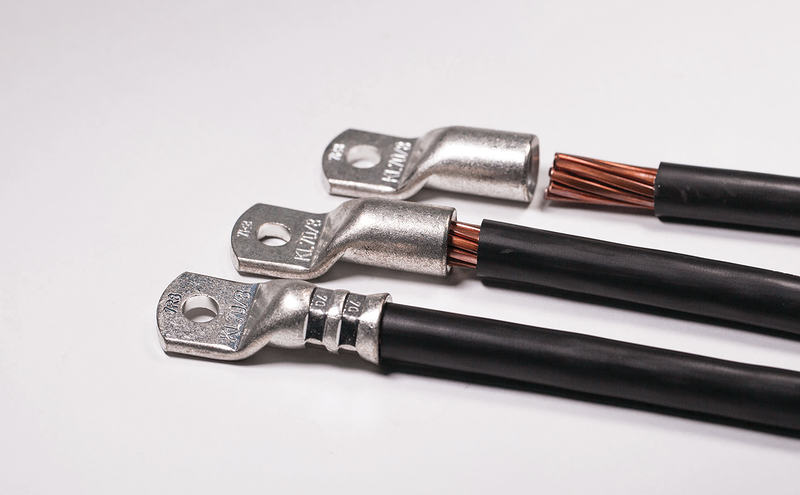 All cable lugs can only be crimped properly when a suitable system is used. A correctly matched die will form a complete hexagon, without any flashing, and in most cases imprints the die or cable size reference in the outside of the barrel for inspection and QA purposes. Klauke recommends using a crimping tool from the same manufacturer as the cable lug to ensure a matched system. Available from Demesne Electrical, the new range of crimping tools from AVAILABLE AT Klauke has pressure monitoring built-in, which ensures the correct force is applied by the compression tool, completing the system and ensuring a perfect connection every time.